Put on your thinking caps! I’m about to explain the most important part of the new Problem-Solving Card Text. Timing – If we make a chain, do I do things when I activate my card or when the card resolves? Targeting – Does this card target something? If it has more than 1 target, what happens if one target goes away? Conditions – What if something changes between the moment I play the card and the moment it finishes up and goes to the Graveyard? The problem-solving card text fixes all of these problems, completely and forever. The trick was how to do it but still have the cards read the same way if you’re not interested in these kinds of details. Starting in July, any card that hits on any of these key areas will have its text rewritten to answer all of your questions. Anything that explains CONDITIONS to activate a card, or limits WHEN or HOW OFTEN you can activate a card, will be written in green and called ‘green text’. Green text limits when you can do things. Anything that happens WHEN YOU ACTIVATE a card will be written in red and called ‘red text’. This includes things like costs and targeting. Anything that happens when you resolve a card will be written in blue and called ‘blue text’. This is what happens when the card effect actually happens. Remember that your actual cards will still be printed in black! The colors are just training wheels to help us explain. On your cards, instead of using colors, punctuation will let you tell what kind of text everything is. Conditions (green text) are now always followed by a colon (:). 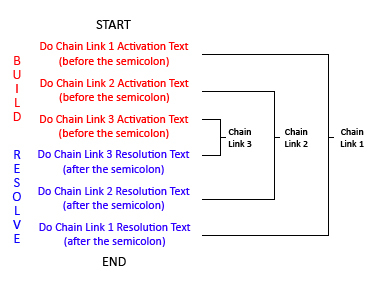 Activation text (red) is separated from the card effects (blue) by a semicolon (;). The basic structure is CONDITIONS : ACTIVATION ; RESOLUTION. Everything in green (before the colon) describes WHEN and under what conditions the effect happens. Everything in blue (after the colon) describes what happens when the effect resolves. When this card is destroyed by battle and sent to the Graveyard: You can target 2 Level 2 monsters in your Graveyard; Special Summon them, but their effects are negated. Make sure the green part (before the colon) is being followed. Do the part in red (before the semicolon) if there is any. Let’s take an example of a 3-card Chain. When this card is Normal Summoned: You can Special Summon 1 Level 3 monster from your hand. Discard 1 card to target 1 card on the field; destroy it. Tribute 1 face-up Level 4 Gemini monster you control to target 1 card on the field; destroy it and draw 1 card. Red goes on top, Blue on the bottom. In other words: everything before the semicolons happens first (all piled together in order), then everything after the semicolons (again, all piled up in order). BIG TIP: If there’s a colon or semicolon in the text, that always means an effect that starts a chain. If there is no colon or semicolon, the effect does NOT start a chain and cannot be chained to. Spells and Traps always start a chain at some point, because activating the Spell/Trap starts a chain all by itself. Some Spells & Traps won’t have a colon or a semicolon. But they still start a chain when you activate the Spell or Trap. (Summoning a monster doesn’t start a chain, so that’s why they’re different). Each player chooses 1 monster they control and switches control of those monsters with each other. Those monsters cannot change their battle positions for the rest of this turn. When a Trap Card is activated: Pay 1000 Life Points; negate the activation and destroy it. The colon is there to show that this card has specific conditions to activate it. The semicolon is there to separate what you do when you activate this card, vs. what you do when the card resolves. Now that we’ve covered the basics on how the cards are written, stay tuned for Chapter 4 to find out some more benefits and details about how to read your new cards! Problem-Solving Card Text, Part 4: The Clues on Your Cards The Master of Faster is Back!